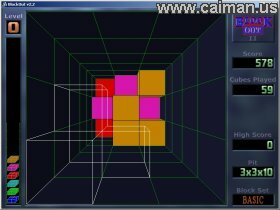 Caiman free games: BlockOut II by Jean-Luc Pons. Also includes well done Online Highscores with a Replay feature. 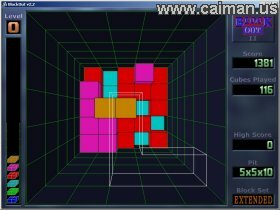 BlockOut II is a Direct3D adaptation of the original BlockOut DOS game edited by California Dreams in 1989. BlockOut II has the same features than the original game with few graphic improvements. Score calculation is also nearly similar to the original Game. BlockOut II has been designed by an addicted player for addicted players.